How do you measure, measure a day? I’ve discovered writing of any kind is rather difficult when I’m only getting a few hours of actual sleep a day. It’s also difficult when I find it easiest to type while sitting down, and a certain little girl doesn’t like it when I sit while she’s sleeping on my back. I have about 12 unfinished posts right now. They may or may not ever get finished, but they’re there. This post will be an update for those who like that sort of thing. 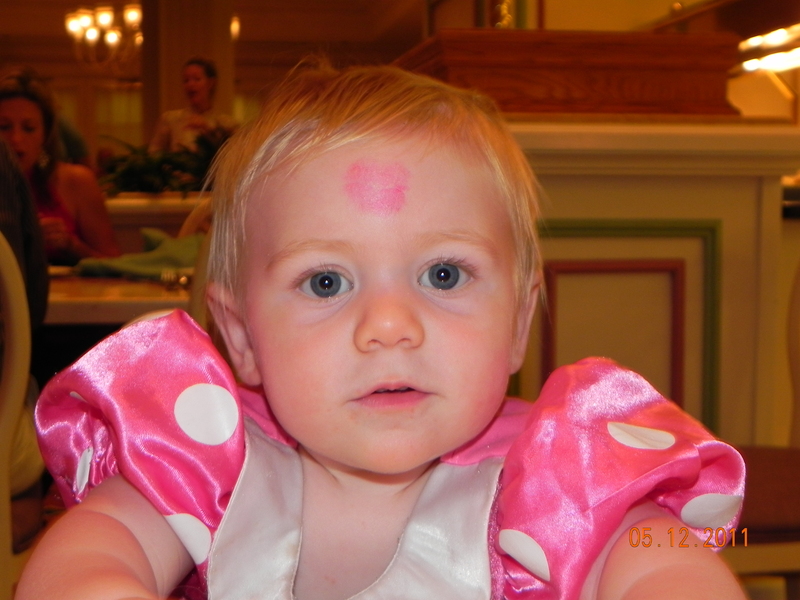 For Ella’s 5th birthday we took the girls to Disney World. We had a blast on our pirate adventure! We took the girls on the Pirates & Pals Fireworks cruise. 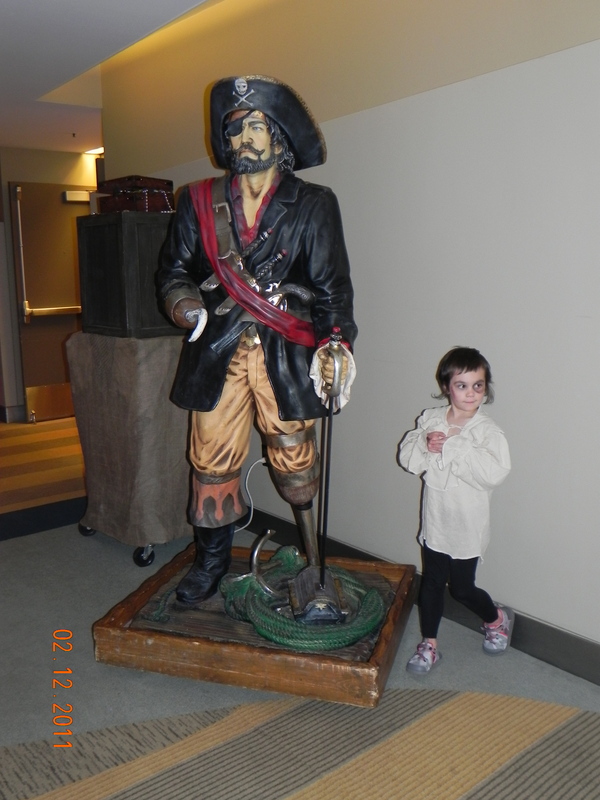 Patch the pirate was awesome – every child won a prize (including Cordelia). We went to Tom Sawyer’s Island and Ella was super excited to find one of the hidden paint brushes. 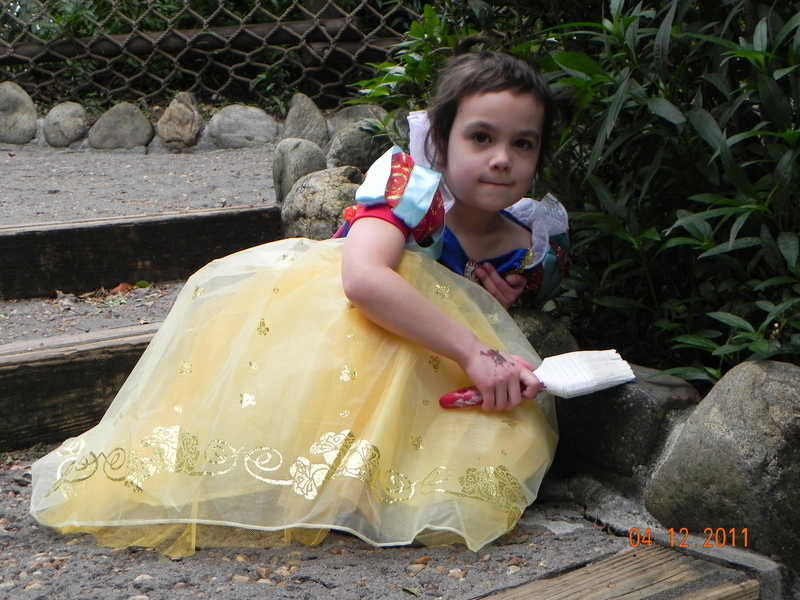 Here’s our Snow White next to where she found the discarded brush. 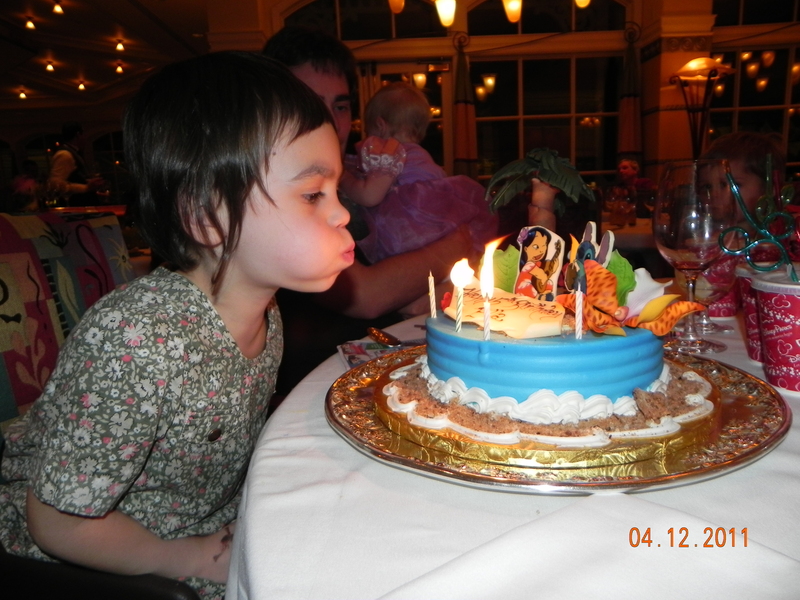 We had a mini birthday party for Ella at Citricos. The Gluten-free cake was fabulous! We were very proud of how calm all of our girls behaved while we sat and ate at a fancy restaurant. It’s normally difficult for them to remain seated and relatively quiet, but that meal they did great. Such a proud momma moment. Cordelia loved all the characters, and they loved her. Hehehe. I could spend hours talking/writing about our trip and if anyone would like to know more, feel free to ask. However for now I’ll leave it here. Since our trip Cordelia’s taken her first steps, and is growing like mad. Agatha’s struggling to gain new independence, unfortunately she wants to do the things Ella does, and She’s just not quite at the same level yet. It’s a frustrating struggle to watch, but every time we try to step in to guide her we just make things worse for Agatha. So we step back. 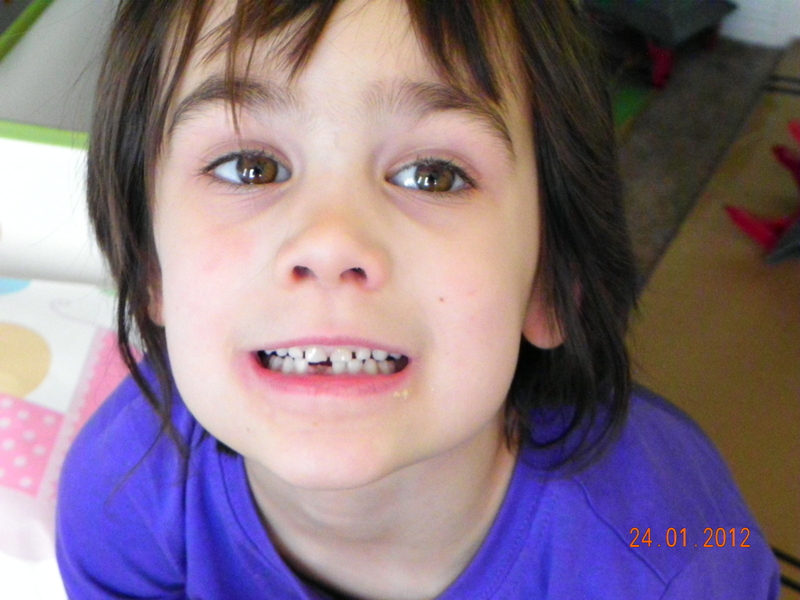 On another note, Ella lost her first tooth. Her little gap toothed smile is so awesome! It’s so tough to see my little baby grow up and realize so many minutes have passed and I barely even noticed them. To top everything off, we’ve added a new member to our family. A couple days before Christmas Ella asked Santa for a dog. She wrote a letter and asked for a dog that would be okay for our allergies, she wanted food and water dishes, toys, and a puppy bed. If Santa brought the dog, then he wouldn’t cost us money (one of the reasons we said we couldn’t get a dog now). We carefully told her Santa doesn’t usually bring living animals and she wasn’t likely to get a dog for Christmas. Then we waited and hoped everything would be okay. Santa did bring her a dog. An old Ty beanie baby puppy I had. BUt Ryan and I talked. And talked. And talked. We talked figured about 20-24 inches should be about the right size for a dog. Not too big, not too small. We weighed the pros and cons of various breeds. Decided on the top three choices. We then said as soon as we got a fence in the spring we’d get a dog. But then we talked some more. a specific breed would be great, but the cost would be astronomical. Instead of a specific breed, we decided we’d just wait until we happened to meet the right dog, even if it was likely to shed. We went to a couple puppy meet & greets the local rescue societies held. WE didn’t get puppy, but we did find a picture of a sweet looking pup named Chester. 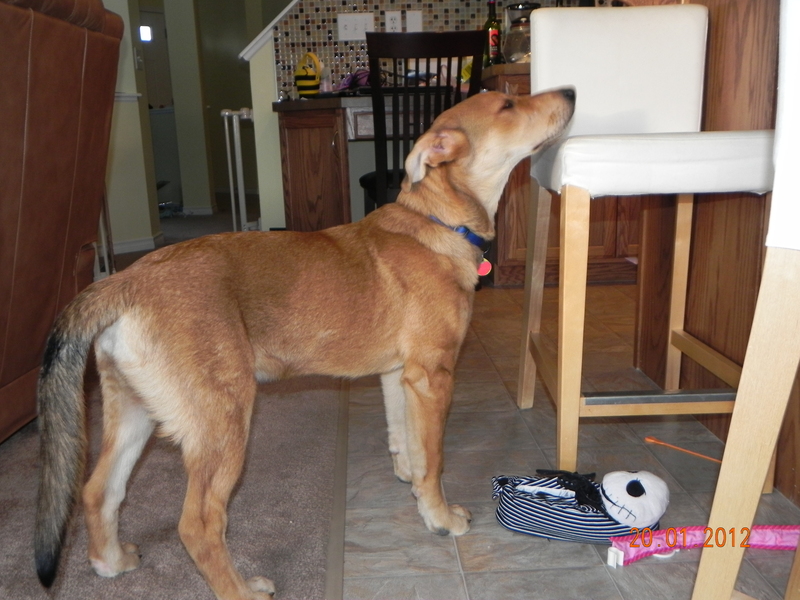 He was about 5-6 mos old and a lab/shepherd cross. He was housetrained and very intelligent. We decided to meet him. 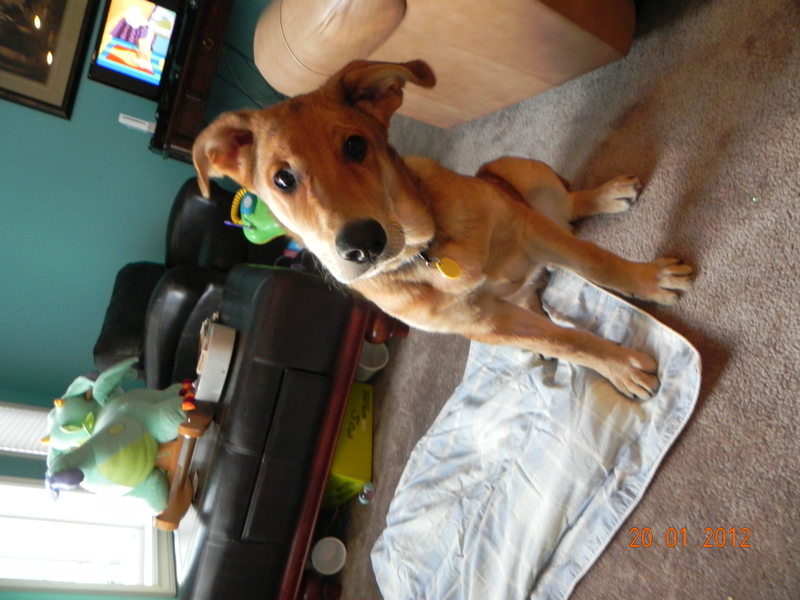 The foster mom later let us know he was likely a shepherd crossed with a wolfhound, and he was only about 4-5 mos old – and almost 50lbs. He was already the size we wanted the adult dog to be and he still has lots of growing to do. We met him anyhow. And thought he was great. BUt we said no thanks, he’s just too big. The next day we met him again. And kept him. Chesterfield (because he’s gonna be as big as one) has been an amazing little (giant) puppy. He eagerly learns new commands and wants to please his people. As a bonus he’s eagerly getting me into shape. I used to runs decent amount, even now I’m pretty fast (at least for short distances) but this puppy can give me a 50 meter head start and pass me in seconds. This little puppy can drag me behind him without even needing to break into a full run. lol it’s a good thing this little puppy has learned ‘come’ and ‘sit’ so quickly. Otherwise I’d never catch him! Before getting a dog we bought the supplies we were likely to need, and the girls had a chance to check them out. The crate was an instant hit. 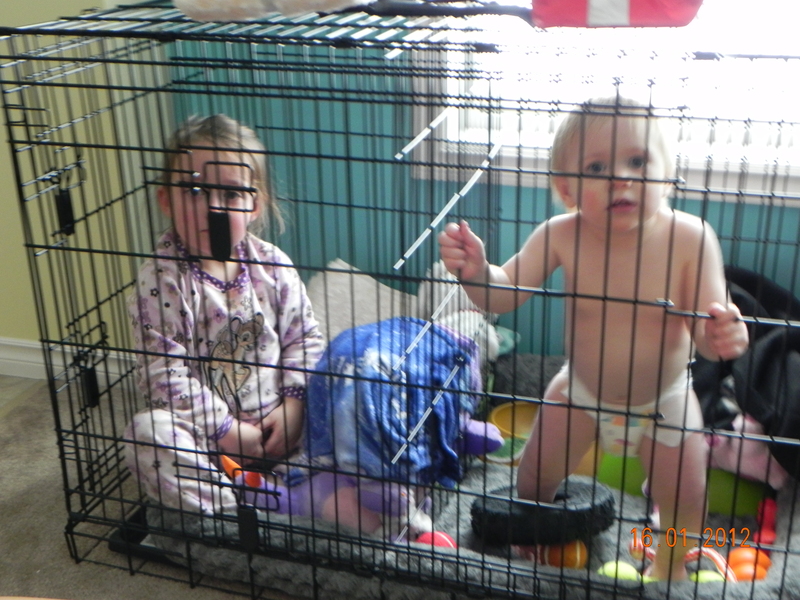 They played jail for hours on end, taking turned being the cop and the bad guys. Cordelia was sent to jail for eating too many cookies. Agatha for laughing too much. I love my girls! Let us out of Jail!